The first chart below is a simplified graph based on the Case-Shiller Home Price Index illustrating percentage increases and decreases in prices for Bay Area houses in the higher-price tier. 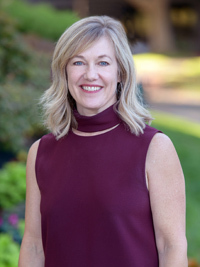 The markets in Lamorinda/Diablo Valley, north-central San Francisco, southern Marin and central-south San Mateo are generally dominated by high-price-tier home sales. All the short-term fluctuations up and down have been removed so that the chart only reflects major turning points in the market. 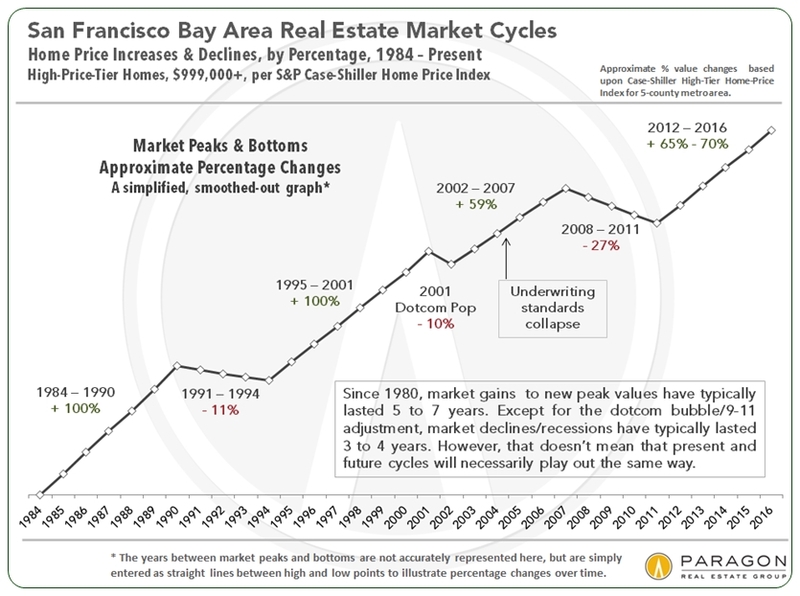 This chart is a general overview for 5 Bay Area counties, and there have been significant variations between market trends in different neighborhoods, cities and counties. The Case-Shiller Index does not measure appreciation by changes in median sales price (as in the second chart below), but uses its own special algorithm, which it believes better reflects actual changes in the fair market value of specific properties over time. It is very important to note that just because market cycles have generally played out in certain ways and on similar timelines over the past 30-odd years does not make it certain they will follow the same pattern in the future. Median Sales Price Trends by Year Lamorinda & Diablo Valley, San Francisco, California & U.S.
Interest rate movements are much in the news since the election, and below are 2 charts illustrating both short-term and long-term trends. Interest rates can be volatile and affected by a wide range of economic and political factors. Rate changes are famously difficult to predict, but many analysts believe rates will continue to rise over the next 12 months. If they are correct, how much and how fast are the questions. As of December 9th, mortgage rates have jumped relatively dramatically, about 16%, since the election, but from a historical perspective, they remain very low. Needless to say, interest rates play a large role in ongoing housing costs and affordability. Below are charts that first measure year-over-year changes in average dollar per square foot values and then changes in median sales prices in Lamorinda & Diablo Valley. Neither of these common measurements of home value is a perfect indicator of changes in fair market value, because both can be affected by a variety of factors to create fluctuations. It sometimes happens that over the same period of time, one metric of value goes up, while the other goes down, delivering ontradictory indications of market appreciation trends. In the charts below, for example, this occurred in Alamo, Lafayette and Moraga over the past year. This is sometimes due to the fact that the average size of the homes sold appreciably changed in the periods being compared. than a larger one. (This has to do with lot values and the costs of kitchens, baths and central systems.) And vice versa: a larger house will sell for a higher sales price but lower dollar per square foot. In Alamo, the average size of houses sold jumped appreciably from 2015 to 2016: Median price increased 6%, while average dollar per square foot dropped 5%. In Lafayette and Moraga, the average house size dropped year over year: Median prices dropped 2-4% and average dollar per square foot increased 2-4%. This is a reminder that these statistics are not perfect, but are approximations in the best of cases, most useful in assessing general conditions, comparing values between different markets, and perceiving longer-term trends. The dynamic mentioned above regarding smaller houses typically having higher dollar per square foot values also helps explain why less expensive cities, with smaller average house sizes, sometimes have comparable (or even higher) dollar per square foot values than more expensive cities with larger house sizes. Note that square footage can be measured in different ways by various appraisers, architects and others, and that some home sales do not publish square footage at all. For median sales price appreciation trends, we will look back to 2012, when the market recovery in home prices really started to get traction in Lamorinda and Diablo Valley. Median sales price is that price at which half the sales occurred for more and half for less, and often disguises a huge variety of sales prices in the individual underlying sales. These changes do not reflect appreciation trends. The median house sales price in Diablo, as reported to MLS in 2016 YTD, was $1,715,000, however, in recent years it has approached $2,000,000.